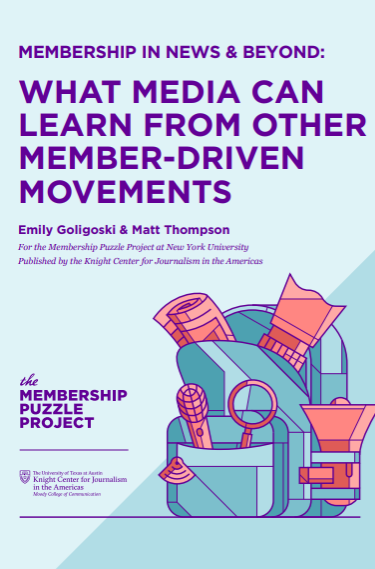 The Knight Center for Journalism in the Americas has joined forces with the Membership Puzzle Project to release the report “Membership in news and beyond: What media can learn from other member-driven movements” April 12 at the International Symposium on Online Journalism (ISOJ). Goligoski and Thompson, along with a team of researchers, tackled the subject of what news outlets could learn from non-news organizations such as environmental movements, churches and open source communities. The focus is on membership and how that business model may benefit news organizations. As opposed to subscriptions, where people pay to access or receive a news product, membership immediately implies a deeper relationship between the news outlet and the member or audience. In essence, a member has stronger ties to a news organization than a subscriber, a lasting connection that may prove more financially beneficial in the long run. The report is guided by three key questions: 1) Why do members join? ; 2) What do members do; 3) How do member communities grow? The Knight Center for Journalism in the Americas helped edit the report and will host it in its Digital Library. Spanish and Portuguese versions are forthcoming and will also be available in the Knight Center’s Digital Library.